I've been thinking a lot about fruit lately. These thoughts go along with my word for 2014: RIPENING. Logical connection, I'd say. Initially, I was thinking of berries. I'm a berry-girl who would rather eat berries than any other kind of fruit....strawberries, raspberries, blackberries, boysenberries...all make me salivate. But the fruit that has dominated my thoughts and which I've chosen to represent my word this year is the pomegranate. Somehow it just feels right. I sent pomegranate-themed new year's cards earlier this month. 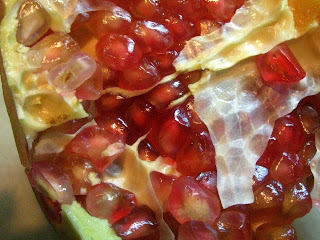 I've been reading about the symbology of pomegranates. I bought one at last Saturday's market to taste.. So, what have I learned from my reading? Pomegranates, which originated in Iran, are now primarily cultivated in the Middle East and along the Mediterranean. They were introduced by the Spanish to California in the 1700s and are now produced there and in Arizona. Being a Californian native, I guess I already knew that last part. Their name derives from the Latin for 'seeded apple.' They have graced heraldic coats of arms and have had their name attached to a weapon of warfare...hand grenades. Their symbol is found in several of the world's religions...Christianity, Judaism, Islam, and Hinduism. And they were also important symbols in ancient Greece, Rome, Egypt and China representing fertility, sweetness, and prosperity. In ancient Egypt, however, the pomegranate was considered the fruit of the dead as its juices looked like running blood. Who knew?? 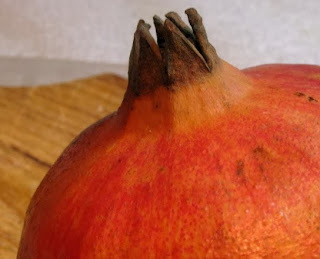 And what has opening my own pomegranate taught me about RIPENING? One thing is that I don't always know what is ripe! My pomegranate was a little pale and wimpy-looking inside. But the seeds were sweet and tasty. So, I guess the message is you have to just put things out there and test them to see if they're ripe and ready to go. Outward appearances can be deceiving. Don't be afraid to try. And keep at it until you get it right! I'll definitely buy another with my new-found knowledge of discerning ripeness. I'll keep you posted on my pomegranate progress.